calling it a bug is probably too much -- the new behaviour is quite reasonable. trying to give it a security angle doesn't seem justified. 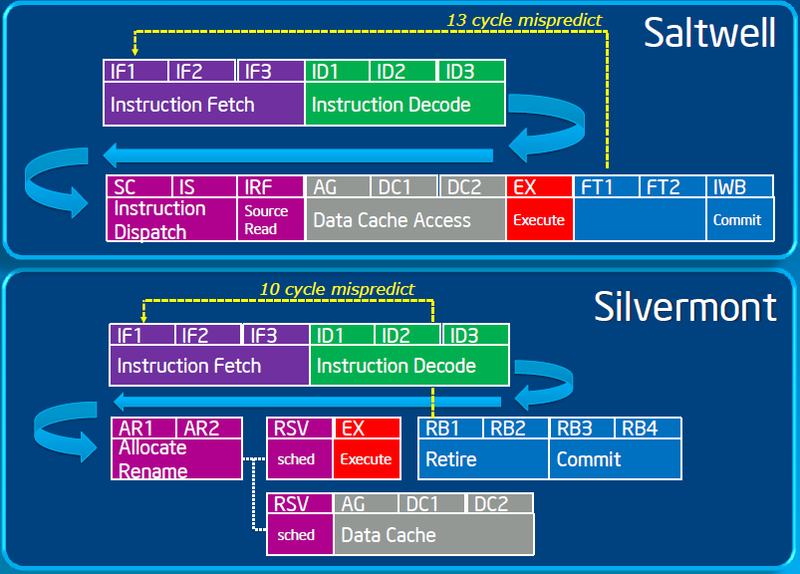 kernel instead of forcing Intel releasing new microcode. and doesn't need the new microcode. Most of that is cache which rarely have errata. look for embedded CPUs which are often really bad. Ironically they have much less transistors than the x86s. subset that actually ended up working in the driver. Andi Kleen (ak-rwt.delete@this.muc.de) on June 27, 2007 4:02 pm wrote: > Matt Sayler (sayler@thewalrus.org) on 6/27/07 wrote: > --------------------------- > >http://marc.info/?l=openbsd-misc&m=118296441702631 > >> : > >" - Basically the MMU simply does not operate as specified/implimented > >in previous generations of x86 hardware. It is not just buggy, but > >Intel has gone further and defined "new ways to handle page tables" > >(see page 58). > >- Some of these bugs are along the lines of "buffer overflow"; where > >a write-protect or non-execute bit for a page table entry is ignored. > >Others are floating point instruction non-coherencies, or memory > >corruptions -- outside of the range of permitted writing for the > >process -- running common instruction sequences." > > > >Ignore for a moment the tone, and concentrate on the substance... > > > >How significant were the TLB handling changes? > > Not very -- they just clarified something which was > previously not well defined (caching of the higher > page table levels) Technically there > was a small specification/behaviour change, but > calling it a bug is probably too much -- the new behaviour is quite reasonable. > > The OpenBSD quote sounds quite overblown to me, especially > trying to give it a security angle doesn't seem justified. > > I'm surprised also Microsoft > just didn't add the necessary flushes to their > kernel instead of forcing Intel releasing new microcode. > > Linux has the necessary flushes for quite some time > and doesn't need the new microcode. > > >In general, do Core2 chips seem to be more or less buggy than previous iterations? > > It's hard to say -- all CPUs have bugs and if you > try to classify them you're on shakey terrain. And > they're usually different (although sometimes multiple > cores get the same thing wrong, but that probably > says more about the ISA than the Cores) > > Most bugs are obscure, but it is hard to say for sure. Also > most can be worked around in the BIOS and they are found > early enough that the production BIOS actually > have the necessary workarounds. > Overall I don't have the impression that Core2 is buggier > than earlier CPUs. > > >Are errata par for the course as we approach billion-transistor commodity MPUs? > > Most of that is cache which rarely have errata. > And a quad core CPU is not necessarily four times > as buggy. But in general x86 CPUs are very very > well tested before they come out and very rarely > have significant bugs (and then those can be usually > worked around in the BIOS). That is why it takes so long > from first samples to you actually being able to buy > the CPUs. > > If you want to look for buggy CPUs you should rather > look for embedded CPUs which are often really bad. > e.g. they often ship with bugs that require compiler > workarounds which would never fly in the x86 world > and generally require OS level workarounds (which is already > very rare in the x86 world, although it happens) > Ironically they have much less transistors than the x86s. > > And some other chips like graphic cards are even > worse -- since they don't have a fixed ISA they > add lots of functionality and then only use the (varying) > subset that actually ended up working in the driver.